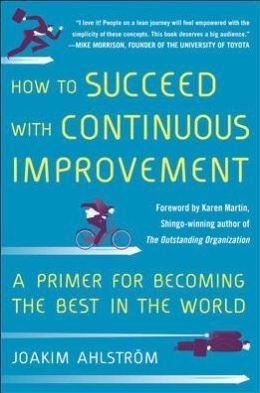 “How to Succeed with Continuous Improvement – A Primer for Becoming the Best in the World” by Joakim Ahlström (McGraw Hill Education, $23). Sounds simple, but it isn’t. Why? Small problems often fly under the radar. Action is taken when the problem becomes too big to ignore. At that point, the company faces urgent improvement, which delays other projects because the fix diverts people, time and money away from them. If dealing with small issues was thought of as a continuing part of closing the aforementioned gap, continuous improvement would result. It would also minimize problems down the road. Company results are posted on a macro basis. Employees don’t see how they affect the results. As a result, they disengage. The fix: Weekly departmental meetings (15-20 minutes max,) that let employees discuss progress and obstacles. By discussing obstacles, collecting thinking can find solutions. How many hoops do people have to jump through to get something done? Procedures are often roadblocks to progress. Procedures need to be relevant to how you plan on working, not to how you worked in the past. Layers of decision-making add to employee disengagement, too. Colleagues are creators and end-users of work product. Think of them as suppliers and users of information. Just like your ultimate customer, they must have their needs met. Appreciating their varying perspectives will improve collaboration and create solutions. 3. How will we get there? Hint on the answer to 3 – Do something different or do some things differently. 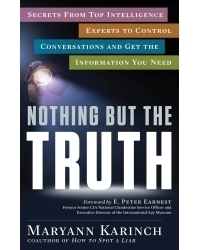 “Nothing But the Truth: Secrets from Top Intelligence Experts to Control Conversations and Get the Information You Need” by Maryann Karinch (Career Press, $15.99). Many people are afraid to tell the whole truth because they fear reprisal, or are too embarrassed to admit they did something wrong. Rather than accept responsibility, they make excuses and blame others. Managers can ill afford anything but the truth. Bad information leads to bad decisions. If you do, the responses will always be guarded, and subject to errors of omission. Once established, trust and respect follow — and so does truth. You can break anyone’s ice with open body language (e.g. smiling when speaking, maintaining eye contact, not folding your arms, etc.). Asking open-ended questions and listening intently shows your interest in a person and his information. Knowing things about someone opens his doors, too. Observation and their colleagues are prime sources. In today’s connected world, a Web search yields tons of useful information, too. Playing off of your open-ended questions and listening, move the conversation along with providing incentives to speak true. Pique your conversation partner’s curiosity by asking questions that suggest you know something that he’d like to know more about. This prompts interest in the topic and deepens the conversational bond. Flattery can be useful, too. By boosting someone’s self-esteem, you build respect. When people believe their information and opinions are valued, they provide more candid answers. Silence motivates, too. Occasionally, create conversational tension by remaining silent while maintaining eye contact. The other party will begin speaking to reestablish the connection. The bottom line: The deeper the conversation, the more likely you’ll find the truth. Jim Pawlak is a nationally syndicated reviewer of business books.